I decided to research the English and Irish classics since 2000. I first looked into the first three of every classic for England and Ireland since 2000. I analysed the sires bloodline in sire and dam, I must admit after gathering the results, I was amazed at the results of this research. There have been 150 classics in England and Ireland since the turn of the century, and starting with the English 1000 Guineas, six of the fifteen winners had Coolmore sires in their bloodline, and had 17 out of 45 in the first three. English 2000 Guineas there have been ten winners with their bloodline and 25 out of 45 in the first three. Epsom Oaks has seen five winners with Coolmore sires bloodlines and 24 out of the 45 in the first three. Onto the Epsom Derby and eleven of the fifteen winners have had Coolmore sires bloodlines and 35 out of 45 in the first three. The final English classic of the flat season the St Leger has produced ten of the fifteen winners with Coolmore sires in the bloodline and 29 out of 45 in the first three. Since the year 2000 there have been 75 English classics and 42 of the 75 (56%) winners and 130 out of 225 places (58%) have had Coolmore sires in their bloodline. Now moving onto the Irish classics and the 1000 Guineas there have been ten winners out of fifteen with Coolmore sires in their bloodline, and 28 out 45 in the first three. The 2000 Guineas has produced nine winners out of fifteen with Coolmore sires in the bloodline and 25 out of 45 in the first three. Irish Oaks have seen six winners out of fifteen with Coolmore sires in their bloodline and 25 out of 45 in the first three. The Irish Derby is the highest of all classics, with twelve of the fifteen winners having Coolmore sires in their bloodline and 36 out of 45 in the first three. The final classic the St Leger have seen eight of the fifteen winners having had Coolmore sires bloodlines and 27 out of 45 in the first three. The Irish classics have seen 45 out of 75 (60%) winners and 141 out of 225 (63%) in the first three. As we all know, Coolmore has been the most successful and powerful breeding operation from some time with it's excellent roster of stallions and in 2014, they also became the most successful breeding operation at the Cartier Racing Awards since its inauguration in 1991 with 3 winners on the night in 2014 taking their tally to a whopping 63 in total. Sadler's Wells boasts the most successful record at the Cartiers as he accounts for 15 award winners alone with his most famous and successful son Galileo sitting 2 behind him on 13 with another former Coolmore stallion Danehill thanks to Gleneagles (champion 2yo) and Noble Mission (champion older horse) in 2014. I'm sure in the next couple of years, Galileo will make this accolade his own by surpassing his magnificent sire and breaking the record Sadler's Wells has held for a lot of years. Montjeu is another Coolmore stallion by Sadler's Wells who has been a really successful stallion at this event with 7 winners of his own including his latest winner in 2014 in Ascot Gold Cup winner Leading Light so even when the Sadler's Wells record is broken by Galileo, his legacy is sure to live on for some time to come. The other Coolmore stallions who have made up the record breaking 63 winners over the last 23 years are Fairy King (3), Caerleon (2), Giant's Causeway (2) and Mastercraftsman, Choisir, Danehill Dancer, El Gran Senor, Tate Gallery, Woodman, Storm Bird and College Chapel all with 1 award winner each to their name with Giant's Causeway, Mastercraftsman and Choisir sure to shine on the biggest stage again yet. 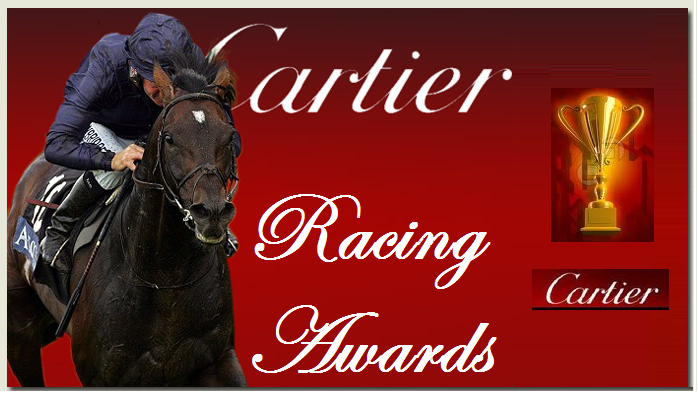 Below is the list of every single Cartier Racing Award that a Coolmore stallion is responsible for, I really hope you enjoyed the read and you enjoy looking back at the list. In 1988 when Caerleon won his first sire championship, who would have ever predicted that by the year 2014 Coolmore stallions would have accounted for twenty six out of the twenty seven sire titles. To put this into context since 1990 Coolmore stallions have triumphed every year. Caerleon won two sire titles in 1988 & 1991. Having sired 101 stakes winners, and a look at some of these he sired. His most famous son Generous English & Irish Derby winner in 1991. Lady Carla (Oaks), Cape Verdi (1000 Guineas), Moonax (St Leger) and Marienbard (Arc De Triomphe). Danehill Dancer won his only sire championship in 2009. Having sired Mastercraftsman who was voted European champion two year old and went on to win the Irish 2000 Guineas and St James Palace. Again won the Irish 1000 Guineas. He was also the sire of, Choisir (Australian champion sprinter), Dancing Rain (Oaks), Starspangledbanner and Lillie Langtry. In 2010 he was in the top four most expensive sires in Europe and has sired 82 group winners. In my opinion in years to come, racing fans and experts will come too look at these titles and, should be astounded at these feats. We should also appreciate this fact because thanks to these sires we can all appreciate the future generation of superstars that keep us talking and reminiscing about our wonderful sport. Finally Coolmore owners and staff should be congratulated for their commitment, hunger and desire to keep their place firmly cemented as the number one stud in the world. Heres to the next twenty five years.